I got my health back, and in doing so, my life back. Before I began the LEAP program with Megan I had been suffering from stomach pains and nausea just about every time I ate or drank, increasing in intensity over about a three year period. Almost monthly, I would have episodes of vomiting and diarrhea that would last anywhere form 1 -3 days. I could not enjoy food anymore. I was unable to have a glass of wine with friends or dinner out, and most days, simply drinking water would cause my symptoms to erupt. I was always tired and struggled to find the energy to get through the day, let alone do the things I love. I was sick all the time. I felt hopeless and had essentially resigned myself to that life. A family member recommended I try LEAP with Megan - I’ll never be able to thank her enough for that recommendation! Amazingly, about 3 days into the LEAP program I had already begun to see a rapid decline in my symptoms. By day 10 I had no stomach aches and was able to drink water like it was my job. After the first two months, I was free of all the horrible symptoms I had been living with for 3 years and had energy to make it through my work day and my workout and enjoy a glass of wine with dinner - something I hadn’t been able to do in years! I was amazed at how free I felt. Megan walked me through every step of the program and was incredibly helpful in understanding the process, providing meal ideas and helping me make initial modifications as a vegetarian. This program was definitely challenging in the beginning; it’s a big lifestyle change for the first part of the program and Megan’s nutritional and many times emotional support was integral to my success. The challenges I faced in the beginning of the program (making meals ahead of time, giving up many of my favorite foods at first) were NOTHING compared to benefits I was experiencing. It was an incredible and empowering experience for me. I got my health back and in doing so, my life back. I highly recommend the LEAP Program with Megan to anyone who is suffering from digestive issues. I wish this kind of relief and happiness for everyone! I began seeing Megan as a last resort to find help for Anorexia. I was looking for someone to work with who could give me long term eating directions, not just another plan to follow. She has been teaching me how to listen to what my body is calling for, as it intuitively knows what it needs. For so long, I had followed food rules, unable to listen to my body and trust what it is calling for. I am grateful I have finally found someone who truly understands. LEAP eliminated all of my IC (bladder) symptoms. ​I recently entered a particularly stressful period in my life, where I accepted a job in a new career path, had a health scare, and was planning my wedding. It was more than I could handle. I came down with strep throat immediately following my wedding, and ended up on a strong antibiotic shot that was in my system for about a month. As I finished my antibiotics, I found myself with continued symptoms of a UTI, but with no bacteria. Over a month I saw nine different doctors. Physical therapists, counselors, naturopaths and acupuncturists…none of whom had a real solution for me. There was no medication that helped. I felt that the modern medical world had completely failed me. I never was officially diagnosed, but had all the symptoms of Interstitial Cystitis - a syndrome for which there is no medical cure or effective treatment. I experienced intense urinary frequency, urgency, and a general burning feeling in my bladder at all times, but especially on days I ate or drank anything acidic. I cut out of my favorite foods: alcohol, salad dressing, fruit, tomato sauce. Even spices like cinnamon bothered my bladder, and a piece of grapefruit I ate set me into a flare for weeks. Instagrams I saw of pizza made me cry. I also had to stop wearing tight jeans and high heels, which exacerbated the condition. I never left my house. It felt like it was robbing me of my entire life. I was terrified, and believed I was destined to feel this horrible pain forever, because doctors (and message boards full of sufferers) have deemed this disorder “medically incurable”. I read about people who’d suffered with it for 40 years. I felt like I was burdening my husband, and wondered whether it was fair to remain married to him. I wondered how long I could handle it, myself. This all sounds dramatic, but bladder pain really is a different level of physical and emotional pain, and can take you to a very dark place. I began to try to avoid the negativity I found online in forums, and focus on the few IC success stories I could find, which all involved diet and healing the gut. By chance, I saw a post of Megan’s on Facebook, which mentioned IC as a condition that could be improved with LEAP. I sent her a message, and after talking with her about the program I signed on immediately. I began the LEAP program in December, which wasn’t an ideal time to limit my foods, but I decided I’d rather start right away and begin to heal, than suffer through the holidays. The beginning of the program was very difficult, as I was already gluten-free, acid-free and dairy-free. I ate a lot of coconut, chicken and sweet potatoes. In the detox period, I noticed all of my symptoms happening at once, and had strange issues arise - my eyes turned yellow for a day, which was certainly interesting. On about day 10, I found myself not thinking about my bladder for several hours. The following day, the same thing happened, but for slightly longer. I improved after that point most days, and found myself with a lot of energy. I was feeling optimistic for the first time in months. I did regress in Phase 3 for about two weeks, after I mistakenly ate soup with forbidden additives. When I returned to all the least-reactive foods for a few days, I quickly noticed my symptoms disappear. Over the course of the program there were other days I would feel worse and get discouraged, but Megan told me it was like climbing a mountain. Sometimes I would have to take a step down in a valley before I would progress. She was right. After about 8-9 weeks, I was feeling pretty great, all of the time. It has now been almost 4 months, and I am so happy to say that I have no signs of my interstitial cystitis symptoms at all. LEAP completely cured me of a syndrome that was deeply affecting me in so many ways. I now drink trigger foods like wine and coffee, and eat strawberries with zero pain. Other symptoms I’d noticed over the years, like anxiety, twitchiness and palpitations have drastically decreased. For the first time in more than a decade, my labs show no iron or vitamin D deficiencies. I have learned a ton and care so much more now about my health, and what is in my diet. I don’t have the words to thank Megan for her help in pulling myself out of the hole I was in. She gave me hope when I believed I could not heal, answered every one of my frantic texts, read my food diary when I had issues, made countless recommendations and really was a wonderful coach through the entire program. I will continue to tell everyone I can think of about Nutrition Transitions and LEAP, because it really did turn my life around. My heart health has never been better. When you work out every day, eat pretty well, and have two heart attacks before age 52, then more professional guidance is needed as it relates to what fuel to put in your body to maximize cardiovascular health long term. Megan McNamee has shown me how to eat for both health and satisfaction. I have been lucky to never have had to diet, and with Megan, I still have never dieted. I just got smarter about what to eat and as a result, my heart health, and my general health has never been better. ﻿All of my pain - and digestive trouble - is gone. I started experiencing food-related symptoms about a year before I met Megan. I like to refer to this time as when ‘my body broke’. I’m sure my symptoms started gradually, but since all of my symptoms, individually, weren’t a cause for concern, it wasn’t until ‘my body broke’ and I started experiencing everything at once, that I knew something was wrong. I always felt full and had very little appetite, my stomach was extremely bloated (24 hours a day), and I regularly experienced sharp pelvic pains and a sharp pain in my foot. My symptoms may seem mild to someone else, but they were enough to interfere with almost every aspect of my life. It was painful to eat, to work out, and even to walk my dog. Even when I wasn’t doing anything at all, I could feel the pressure from my bloated stomach and was miserable. At the time, I didn’t realize my symptoms were food-related and bounced around from doctor to doctor to try and find the root of the cause. One doctor thought it might be ovarian cancer, so I went through a battery of tests for that, another one told me that I needed to take an over-the-counter heartburn medication every day for the rest of my life to help reduce bloating. When one doctor suggested everything may just be related to IBS, I researched a common diet used to help reduce IBS symptoms. This diet helped reduce my symptoms *somewhat*, but was very restrictive and I wasn’t sure how to maintain it for a lifetime. Feeling that I was doomed to this restrictive diet for the rest of my life, I started developing a very negative attitude towards food – I used to love to cook – I used to love to go out to eat – and both of these activities felt more like chores to me at this point in my life. After hearing about my struggle with this diet, a friend recommended that I talk to Megan. And after a few email exchanges with Megan, I decided to take the plunge and commit to the MRT LEAP program. I was very grateful that Megan was willing to work with me even though I live in another state. I’m sure I could’ve found a qualified dietician where I live, but after being bounced around between so many doctors, having a personal recommendation carried a lot of weight. After I got my MRT results, Megan and I had our first phone meeting – together we worked out the phases of my plan, my start date, meal ideas, and resources (like some Pinterest boards to follow). I told myself I was entering this program with an open-mind, but that was definitely not the case. It was very hard for me to get my old restrictive diet out of my head. My MRT results were not that bad and after previously having to remove so many foods from my diet, I was hesitant to trust those MRT results. However, I trusted Megan (I had to keep reassuring myself of this throughout the program). The first few weeks on the program were awful. I felt like a walking zombie. I had no energy, I had headaches, and my symptoms were worse than before. Megan tried to prepare me as much as she could for my ‘withdrawals’ and was very supportive during that time – I’m not sure I could’ve gotten through it without her. Every time I emailed her to say that I didn’t think things were working, she gave me encouragement and motivation to trust the program and stay with it. And, of course, she was right (I knew I trusted her for a reason). After a few weeks, I started feeling better… more energy, less headaches, and lessened symptoms. At this point, I was an emotional rollercoaster… I would have a good day and would be very hopeful that this program would be my savior… then, I would have a bad day and would convince myself that LEAP was not going to work for me. Megan was wonderful. She understood when I felt frustrated and she helped to motivate me to keep going. Then, after 9 weeks of the roller coaster, it was almost magic how quickly I felt better. Every single symptom that I experienced was GONE. I couldn’t believe how great I felt (and never had to go back to those heartburn meds). I’ve officially ‘graduated’ from Megan’s program and am still feeling great. All of my pain is gone, my stomach is no longer bloated, and I have my appetite back. Every few days, I add a new food into my diet and everything (so far) has been successful. Soon, I will be able to try foods that I’ve reacted to in the past and I’m very hopeful that some (if not all) of them will be successful, too. As if my health isn’t reward enough, Megan restored my love for food. I love to cook, again, and am hopeful that I will be able to go to a restaurant sometime soon. As an added bonus, I lost 14 pounds during this time. I cannot thank Megan enough for her guidance and support throughout this process and recommend her to anyone who is even thinking they may have food sensitivities. I found Megan to be incredibly knowledgeable – every time my body threw me for a loop, she had something up her sleeve for me to try. When I was following the old, restrictive, IBS diet, I felt a lot of pressure to make the correct decisions for my body when I didn’t know what the best decision was. It was such a relief to be able to depend on an expert and take these decisions out of my hands. 1. This is an investment – besides the cost of the test/ program, my grocery bills also increased during this time. I’m someone who follows a strict budget, but I also knew that my health was worth a few extra dollars a week. 2. This is also a time investment – you will need to allow yourself extra time for food preparation. 3. I NEVER cheated – because I committed to this program and investment, I figured I owed it to myself to follow every rule, strictly. Megan lays out everything you need to do to heal yourself, but it’s up to you to follow the plan. 4. Don’t lose hope – Megan had to talk me off the ledge a few times during this process. There are days/ weeks that your body will frustrate you – it’s perfectly fine to be frustrated and mad, just keep adhering to the plan – everything will come together eventually. 5. You need a lot of support – My husband was an amazing partner during all of this. He ate the same dinners I ate and never complained. His encouragement and support kept me focused on the goal: a healthy me. 6. Buy belts – Seriously… 14 pounds! I recommend her to any expectant mother! During my first pregnancy Megan has truly been an incredible resource for me. She has assisted me in not only wellness suggestions/supplies but also with a vast amount of extremely helpful information/recommendations that I have diligently applied in my daily routine. I am thrilled that I had her as my go to person throughout this important time for my baby because I know that she is receiving the best prenatals and whole foods because of my knowledgeable nutritionist. The trust that I have in Megan goes far and deep. She has truly steered me in the right direction; researching the best supplements for not only baby but that are easy on my system as well. All my tests have come back right on target and my OB supports the information/supplements that Megan provided me with. I have also been given additional information about breastfeeding, general wellness for baby and me, pregnancy fitness, post pregnancy information and much more. It goes without saying that I recommend her to any expecting mother during this special time in your life. I don’t know what I would have done without her! Improved concentration, no headaches, no bloating, and better skin! I am a 25 year old female who has had severe stomach issues for approximately 7 years. I have had multiple blood tests and scopes done that all came back negative for diseases such as Celiac, Crohns, etc. I had also tried every type of supplement one could possible imagine. It seemed as though the supplements would work but I still felt completely miserable basically every day. It became such a disturbance that I would be embarrassed to go places because I almost always knew I would have stomach issues. I also became a very “picky” eater because I was determined I knew at least some of the foods that caused me issues. I then began a really intense school program and became very busy. My face started breaking out in huge cyst-like zits. 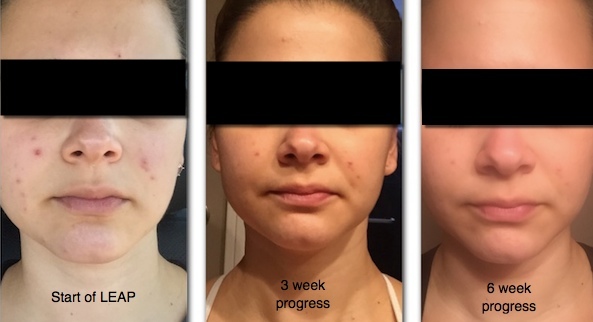 I have a very good background in nutrition and I had a feeling that my skin was beginning to show the inflammation that was taking place in my gut. I have had clear skin my entire life so I never knew what it was like to have zits and let me just say I was NOT happy. I spent close to $1,000 on facials and face products. Nothing seemed to work. Megan introduced me to LEAP and I was immediately interested. She explained to me how it helped heal her gut and thought I would be a good candidate. After researching the diet, I knew that I had to try it. Even though I was still in the process of finishing up my school program, I knew I had to give it a try. The first three days, I must say, were not very fun. I had horrible headaches and felt very tired. After a week on the program, I immediately started to see results in the way my stomach felt. I was no longer bloated every day and my concentration levels also improved. It may seem strange to say but it is SO nice when you can eat a meal and not feel extremely bloated for hours after. It took a little bit longer to see results in my skin. I would say around 4-5 weeks is when I really noticed a difference. Overall, my skin looks much better and even the keratosis pilarsis on my arms, that I’ve had all my life, has started clearing up. This program is difficult but definitely manageable. I have never been on any type of diet plan before and was able to do it. I have been on it for six weeks and I have not cheated once. It is really easy to do because basically you know that if you cheat you are going to end up feeling pretty miserable. I thank Megan for all of her support on this program and for introducing it to me. I hope to one day become a Certified Leap Therapist so that I can have the opportunity to impact someone’s life the way Megan has impacted mine. Thank you so much Megan, you truly are amazing! Great for making peace with food. I feel so blessed to have found Megan McNamee, Registered Dietitian and Intuitive Eating Coach. Megan is intelligent and compassionate. She seems to know just what I need: encouragement, support, or to be challenged. Megan is very knowledgeable and has deep experience with the Intuitive Eating process. I recommend her to anyone who wants to make peace with food. She is awesome!!! It only took a one hour session with Megan to realize the importance of intuitive eating and how essential it is to really listen to your body. Her fantastic blog is my new favorite place to visit when I need creative and healthy recipes! I silenced the voices in my head and lost weight without even trying. Before I started seeing Megan I felt like there was no one in the world who could understand the struggle I had with food. I was so concerned with counting calories and losing weight that I had completely lost touch with my sense of hunger and felt like I was losing my mind! Megan's ability to listen and understand in ways that no one else could lifted a tremendous weight off of my shoulders. But most importantly, the way she was able to interpret and apply all of those negative thoughts has led me to have a better relationship with food (and myself), silence the voices in my head and even lose weight (without trying! ).